By 1965 Szabo had moved on from Hamilton's group, working for a time with The Gary McFarland Quintet and in a quartet fronted by his Hamilton bandmate Charles Lloyd before initiating his solo career in 1966 with the release of Spellbinder. A track from this album, Gypsy Queen, would later be adapted into the successful single Black Magic Woman by the band Santana. The following year, he formed his own quintet, with whom he recorded a series of albums for the Skye label during the remainder of the decade.
. Concurrent with the growing popularity of rock, Szabo began to integrate the use of feedback into his playing, as well as intergrating aspects of Indian music. 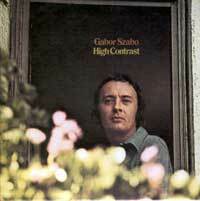 Following the dissolution of his quintet, Szabo assembled a sextet; the new band concentrated on a more commercially-accesible style of music and began an active West Coast performing schedule. Numerous collaborative projects also materialized throughout the 1970s - including High Contrast, a critically-acclaimed album with Bobby Womack, and sessions with Carlos Santana. Towards the end of the 70s, Szabo had begun to travel back to his homeland, instigating a renewed interest in his Hungarian heritage. His recorded output had become uneven by this time, in part as a result of a long-standing struggle with heroin. Seeking some respite from his problems, Szabo joined the Church of Scientology, enrolling in their drug rehabilitation program and signing on with their management agency; the guitarist's final recording, Femme Fatale - done in collaboration with fellow Scientologist Chick Corea - followed in 1979. A brief resurgence of musical activity was managed at the start of the 80s, but in 1981 Szabo returned again to Hungary. The following year he died of liver and kidney failure in a Budapest hospital.